Why CPM banner? Because in terms of CPC no one can defeat Adsense. Many ads network including buysellads, tribal fusion that is called the best adsense alternatives not gonna accept you if you don't have your own domain. This is like "If you don't have money, you can't make money." And pop-up ads or interstitial ads can annoy your visitor. So here I present to you the best adsense alternatives (CPM banner) for Blogger / Blogspot. If blogger is approved by these ads network, then website is more easily approved. First I'm gonna explain CPM. In latin mille means thousand, so it is not mile 1.6 km. For example CPM rate = $0.1 (Not $1 like example from other website which is ridiculous). This means for 1000 impressions you will get $0.1. If your web / blog have 10000 impressions per day, you got $1 per day. But different ads network have different rule. For example there's something called fill rate. What is fill rate? Fill rate is percentage of ads that is served. For example fill rate 10% means if you have 10000 impressions per day, the ads served is only 1000 impressions. You can use other ads network to fill the rest 9000 with passback tag. About impression, sometimes ads network not count all impressions. Sometimes only count visitor, sometimes unique visitor. So don't expect to get what you count because it will miss most of the time. If you wanna make money with CPM ads network, at least you need 1000 visitors per day. Visitors from tier 1 country (USA, Canada, UK, Australia) can give higher CPM rates. Review: Count all impression / 100% fill rate. You can also use ministitial ads that load when your web / blog load. Ministitial is less annoying than pop-up ads. Review: Use footer, shadow box, slider, topbar to significantly increase CPM. Use sliding banner to increase CPM. Review: No minimum traffic limit. High CPM unfortunately you can place only 1 banner per page. 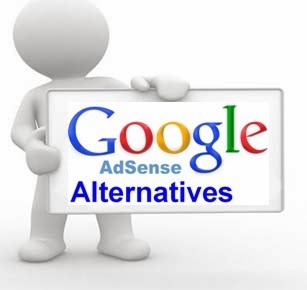 OK, that is top 4 best adsense alternatives. If you wanna use popads use https://www.popads.net/users/refer/25656. Update: Unfortunately some of ads network above no longer accept blogspot. Just try it first. I was just going to try Propeller ads and I came across your site. Thank you very much for your elaborate review. I am happy that I read it. I am earning about $1.2 for 10,000 impressions on an average per day from Adversal. But I heard that the CPM rate for US traffic is about $1 (pretty impressive). This is the best that I could find. Do you know a CPM network that pays more than this? I will go for admediaking.com because I am earning about $2 for 10,000 impressions on an average per day from AdMediaKing. I am a premium member. Interesting list. Some I have never heard of but I did try Pulsepoint. The only reason I don't like them because of the horrible fill rate you get as soon as you put the floor price to a decent number. If you got some traffic than just try ValueClick or Sulvo.com, you won't regret them. can you use more than 1 advertising company at a time? Yes you can. But be careful when you use adsense. And too much ads on 1 page can slow your load time. still confused which is better ..tried chitika but i think it will work if you have visitors in usa/uk..
anybody suggest the best one ?? ?